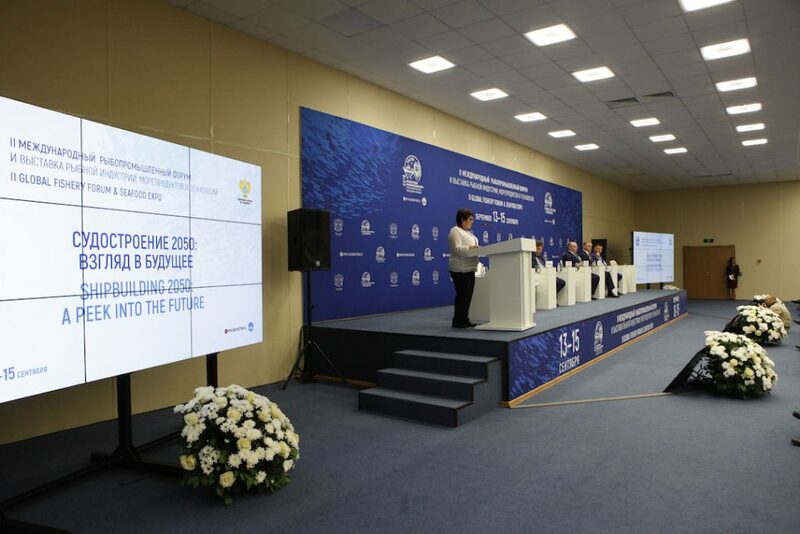 On September 13 within the framework of the II International Fisheries Forum, the conference "Shipbuilding 2050: A Look into the Future" was held. The experts discussed issues of increasing the economic efficiency of fish production by using modern vessels, gear, practical application of other modern technologies, and the safety of world fisheries. The opening was greeted by Lyudmila Talabayeva, member of the Federation Council of the Federal Assembly of the Russian Federation, member of the Federation Council Committee on Agrarian and Food Policy and Nature Management. "Leading global companies tend to be socially responsible. First of all, we are talking about the production of quality products, respect for the environment and local residents. We have introduced a state support tool for enterprises building fish processing plants and high-technology fishing vessels, which means that high-quality and affordable fish will appear. The fishery complex will become an example of socially responsible business, "Talabayeva said. Today the world produces 90 million tons of wild fish and another 80 million tons are grown. The population of the planet by 2050 will reach, according to forecasts, 11 billion people, which will require about 300 million tons of fish. In this regard, the issue of the effectiveness of the fishing fleet, which is necessary, including for the development of prospective resources, is becoming more urgent. As the deputy head of Rosrybolovstva Petr Savchuk noted, today in Russia the process of creating a high-tech fishing fleet is launched, until 2030 its level will increase in terms of the characteristics of operation, safety and comfort of the fishermen's work. "Today it is very important to lay down trends by 2050, we need to talk about general trends and technologies. The fundamental principle is that everything starts with the final product, "said Petr Savchuk. The state plans to introduce complete waste-free production, increase efficiency. According to the deputy head of Rosrybolovstvo, in Russia it is necessary to build at least 100 fishing vessels until 2025, which will allow 50% to renew the total fleet capacity. New vessels will be more efficient than existing ones by 30%. A new tool to stimulate fleet renewal is investment quotas: 33 orders are placed in Russia's shipyards. "We are interested in the development of this sector and are considering additional support measures," said Nikolai Shablikov, deputy director of the Shipbuilding Industry and Marine Technology Department of the Ministry of Industry and Trade of Russia. During the round table "Course 2050: the trajectory of improvement", representatives of the professional fishing industry community, Russian and foreign experts spoke. Chairman of the Board of Directors of Nautic RUS Alfred Tulinius stated the need to build ships for the needs of specific customers, and Deputy General Director of the Krylov State Research Center Oleg Timofeev said that domestic designers have begun to restore competencies in the field of fishing fleet in the last 2-3 years. According to him, in the trend - environmental requirements, avoiding the use of heavy fuels, increasing power-to-weight ratio, reducing the impact of physical fields, increasing the economic efficiency of ship operation. Experts noted that the ships of the future will turn into safe, eco-friendly and "smart" automated systems with a minimum of crew, with digital technologies. At the same time, it is necessary to balance the interests of the state, the shipyard and the fishing company in order to update the fleet. In order for the fish to be of high quality and affordable, it is important to create continuous transport chains, to keep the products as long as possible fresh. Dmitry Stoyanov, Deputy General Director for Civilian Marine Engineering at KNIS, said that at the end of 2017, the center of the North-Kazakhstan region was set up as a center for import substitution and localization on the basis of the Kurs Central Research Institute. During the round table on fishing safety, the position of Rosrybolovstvo was announced: the fishery fleet should provide comfortable and safe working conditions for fishermen. According to the International Labor Organization, fishing is the most dangerous activity, with 24,000 accidents per year on board. In this regard, it is necessary to implement the Cape Town Agreement of 2012, which concerns the enhancement of the safety of fishing vessels. It is necessary to implement an international regulatory framework, to comply with all aspects of ship safety, including their design features, crew training, competence of the shipping company itself.